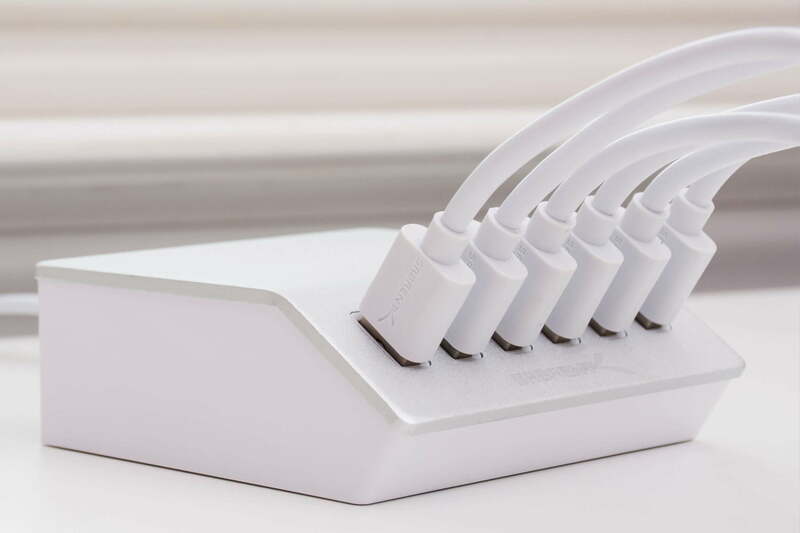 If you’ve ever fought with a partner, parent, or roommate over who gets to charge their smartphone next, then it’s time you bought yourself one of the best USB charging hubs in existence. We all need access to that outlet to keep our smartphones and tablets fully juiced, but there’s no need to argue. A good USB charging station will plug into a single power outlet and afford you multiple USB ports. Identifying the right multi-port USB charger for you will depend on your needs, but, thankfully, we’re here to help. We’ve been testing some of the more popular USB charging hubs available, and we’ve rounded up some of the better options below. 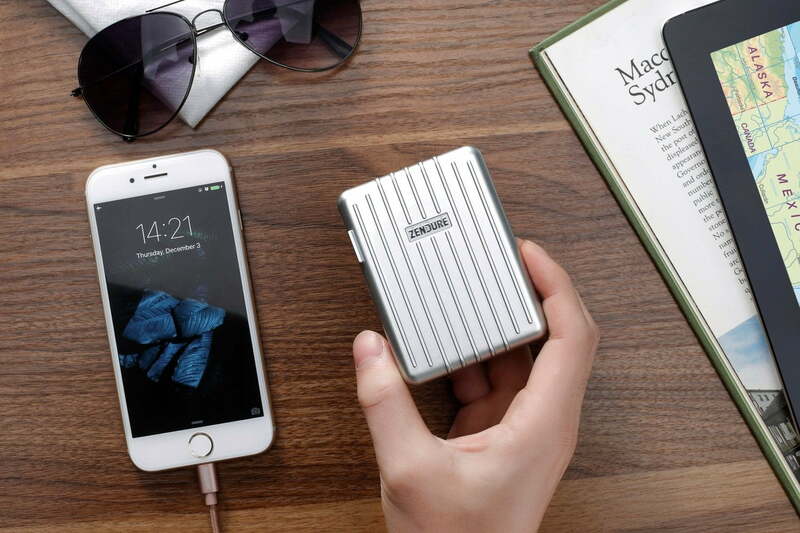 Also, you may be interested in our picks for the best portable battery chargers, if you’re looking to keep your phone juiced on the go. If you’re not a fan of the utilitarian charging brick look, then this USB charging hub might just tempt you. It has a kind of egg-shaped, sci-fi aesthetic with a blue LED night light built in. There are five ports in total. Four offer 2.4A apiece, but the fifth supports Quick Charge 3.0 for up to 3A. The charging cable and plug are attached and there is a decent length to reach an adjacent outlet from desk height. This hub works well on a living room table or desk, but you are probably going to want to invest in a few short charging cables to avoid a tangled mess. You can turn the LED off if you want to use it on a nightstand, though you will need to use the pin tool provided. It’s fairly sturdy, though there isn’t much weight to it, but the rubber grip bottom prevents it from sliding around. It comes in black or white. Nomad‘s USB charger takes the cake in terms of design. The device’s circular, polycarbonate body, which looks something like an enlarged hockey puck, sits on steel inserts and houses five USB charging ports under a discrete rubber top. It draws a maximum of 27W from a 1.2-meter cable connected to a wall source and divides it among two high-power 2.4A ports and three standard 1A ports. (Nomad says they’re compatible with all iPhones, iPads, and Android devices, but notes that they don’t support rapid charging.) A handy ring of LEDs — which dim automatically at night thanks to a built-in ambient light sensor — glow orange when plugged-in devices are charging, and white when charged. The Nomad USB Charging Hub isn’t cheap, but you’ll be hard-pressed to find a more stylish charger in its price range. 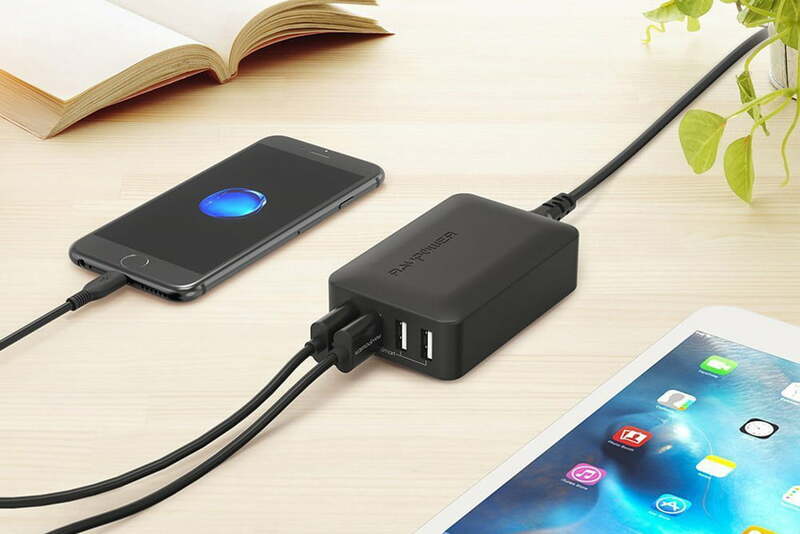 We’re impressed with the design of this durable USB charging hub, which also serves admirably as a travel adapter. 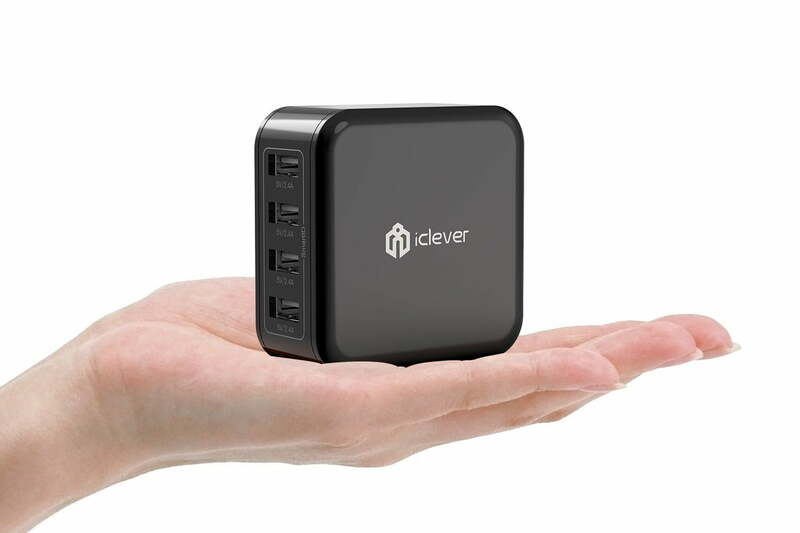 It’s compact and portable, with four USB ports on one side and fold-out prongs to plug into a wall outlet on the other. One of the ports, marked in green, is compliant with Quick Charge 2.0 — which promises 75 percent faster charging — while the other three, marked in blue, can deliver up to 5V/2.4A apiece. You also get two adapters in the box, which slot on securely to work with various outlets throughout Europe. The fact that it plugs in sideways can be a little awkward depending on the outlet, and you’ll find charging speeds are slower when using all four USB ports at once because the total output is limited to 8A. Nonetheless, this USB charging hub is still a good value. If you’re looking for a USB charging hub with plenty of ports, then this desktop option from Sabrent is worth your consideration. It boasts six USB ports, each of which is capable of delivering 2.4A, allowing for 12A of simultaneous output. The wide base and rubber feet also ensure that it doesn’t slide around, and the USB ports are slightly angled upward, making it easy to plug in and unplug cables. The top panel is aluminum and comes in either silver or black. It’s not the most attractive hub on the market, and there’s no QC support, but it is fairly small and cheap. This neat, curvy cube will look good on your nightstand. It comes with three adapters, so you can use the top to charge an Apple Watch, a FitBit Blaze, or a smartphone, with the cable tucked neatly away inside. To boost your charging options, there are also three USB ports in the front. Each port can deliver up to 2.4A, but the total simultaneous limit is 6A. It comes in gold and black, silver and white, or black and space gray. Here’s a USB charging hub from a trustworthy name — one that also happens to be a great deal. RAVPower’s Charging Station has four USB ports, one clearly marked as a Quick Charge 3.0 port and three additional ports that are capable of delivering up to 2.4A each, resulting in a total output of 8A. It also comes outfitted with an AC power cable, along with a green LED that lights up when it’s connected. This is a very compact charging station, so it’s a good choice if you want something portable. It even has a handy silicon base to prevent it from sliding off your desk or table. This is going to be enough to meet most people’s needs for a busy household. You get six USB ports, and Anker’s PowerIQ and VoltageBoost technologies ensure that your device is charged as quickly as possible without exceeding the supported rate. The maximum output for a single port is 2.4A, with a total maximum output for all six ports of 12A. You get a nice, long, removable power cable with a Velcro strap to keep things tidy. This is an efficient, durable, and portable option. The design is functional and there’s a small, blue LED that lights up when it’s plugged in. The nice thing about this is that you can plug into any port and get up to 2.4A. Unfortunately, there’s no Qualcomm Quick Charge 2.0 support. This USB charging hub has two ports that support Qualcomm’s Quick Charge 3.0 standard, clearly marked in orange. 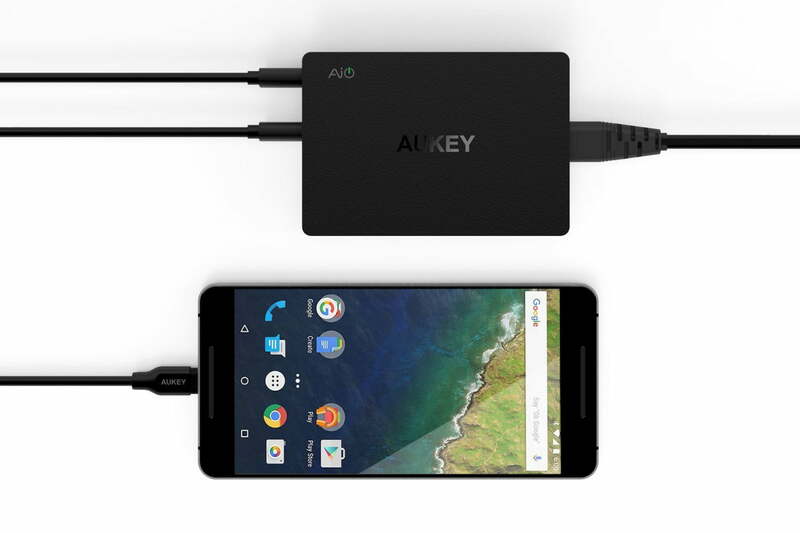 There are another four ports that go up to 2.4A with Aukey’s AiPower technology, so they’ll determine what rate to charge at when you plug in your device. There’s a removable power cable, but it’s only 2.6 feet long, which might be a bit short for some people, though it’s easier to keep tidy. There’s also a small green LED on the side to indicate that it’s connected and ready to go. Here’s a wonderfully compact solution that plugs directly into the wall outlet. You can fold the plug away making it 2.44 x 2.44 x 1.12 inches in total, which is ideal for traveling. It has four USB ports, each capable of delivering up to 2.4A, but the total simultaneous limit is 8A. SmartID technology ensures that your device is charged at the correct rate. There’s a blue LED to indicate when it’s plugged in and it also lights up the top two ports, which is handy if you’re fumbling in the dark. Featuring a circular design, this USB charging station looks a little different from the crowd. You can charge up to six devices at once. Each port can go up to 2.4A, but you only have a total of 6A available simultaneously and there’s no support for fast charging standards here. It’s compact and light, with a silicone ring on the bottom that helps it to grip surfaces. There’s a blue LED indicator on top, so you know when it’s plugged in, and the power cord is a decent length. Update: Removed some discontinued products and added the Jelly Comb.